Garlands are a fabulous way to brighten up tables – particularly at a wedding where they can jazz up even the dullest table cloths! These days they are very popular for marquee receptions making an instant impact; and they can be complemented with swagging around the marquee poles or even hanging from the ceiling. Garlands are time consuming and can prove very costly, particularly is they are primarily made out of flowers. A cheaper and equally stunning option is to use foliage, either by itself or with a few well placed flowers or ribbons. There are a couple of points you should consider before making your garland. There are basically two methods of constructing a garland. Wiring or using a series of floral foam bases. Wiring is best for a table garland. It’s lightweight - a definite advantage when hanging it - and it can also be prepared beforehand. The downside is that your garland will obviously be thinnerFoam garlands should be kept for when they can be secured firmly by tying onto nails or hooks. 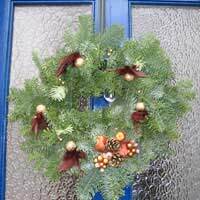 This is a very common method used to decorate around church doorways. It is also a very expensive option as it is time consuming and you need a lot of materials to disguise the foam. To be perfectly honest, the most difficult part of a garland is actually fixing it! What are you fixing it to? If it’s a table cloth, make sure it is strong enough to take the fixings. Consider the weight. Is it so heavy that it could pull the table cloth off once you’ve fixed it? What materials have you used? Think about whether they will mark the cloth – particularly if it is a family heirloom! If you are using a foam base don’t saturate it with water otherwise there will be drippage onto the floor. Ideally it would be fabulous to attach the garland to small nails or hooks – but this is not a likely option when you are decorating a table. Instead make sure you keep the garland lightweight. This can then be fixed to table cloths with drawing pins or tacks. Use foliage such as euonymus, conifers, box or ivy as they are sturdy with strong stems. They can also survive without water for several days which is perfect if you want to create the item in advance. You will need: florists’ scissors; strong binding wire; raffia; euonymus and pearl headed pins. Lay out your foliage and cut it into equal lengths – approximately six inches long. Each section of foliage should overlap the last, with the stem from the previous piece being firmly wired onto the next. Always make sure that the foliage is securely bound together and there are no weak points otherwise your garland could loose its shape or even worse break off. Continue doing this until you get the desired length without any “bald” bits. Finish it off by binding the wire firmly round the last stem with a length left for fixing. You can then loop the garland in front of a table or around it depending on the type of table i.e. round or rectangular. Fix it into place by threading a pin through the table cloth. Loop a piece of raffia behind the pear headed pin and securely tie to the end of the garland. Use the remaining length of wire to secure it further. You can then create a bow with the raffia to finish it off at each looping point. If you are going to use flowers in the garland, you should add these after you’ve created it. You could add them as you go along but this will limit when you can actually put it together as the use of fresh flowers will mean that it has to be made on the day. To add flowers simply wire and tape them and then push the wire through the foliage and bend over at the back to secure it. Make sure they are evenly spaced and create a pattern – this will be easier to stick to than attaching randomly.The flowers should be long lasting – chrysanthemums, carnations, roses, wax flower, statice and hydrangeas are all ideal. Don’t use liner flowers as they will stick out too far from the garland and you will loose your nice even hanging effect.